[0:05] <donta> how do I change my rpi's ssh password? [0:08] <Encrypt> Did you type teh correct user and password ? [0:13] <donta> how would I default to root? [0:14] <ShorTie> su and password is to much to type ?? [0:14] <Encrypt> To log in as root, just "sudo su"
[0:15] <donta> reboot to restart? [0:15] <donta> any reason to shutdown? [0:16] <donta> really, for mail? [0:17] <donta> wouldn't you fear it'd go down? [0:17] <donta> why not use gmail's servers with an apps account? [0:17] <donta> how can I check temps? [0:18] <yggdrasil> how do i give my user acess to fb0 ? [0:19] <Encrypt> Ya, don't hesitate to do that!!! [0:19] <Encrypt> And you can even write down the steps you followed to get your pi working!! [0:22] <donta> do you know how I can change ssh port? [0:23] <Encrypt> donta, On your router? [0:23] <Encrypt> Didn't you say it would be for local use only? [0:38] <chainey> rikkib are your pi's uploading images to an intermediary server, or are you hosting the jpegs straigt off the pi's? [0:42] <rikkib> The cam Rpi has 2gb sd card with just the boot partition. [0:43] <chainey> u usin zoneminder? [0:46] <rikkib> I may grab one of the sun racks for my workshop here. [0:47] <chainey> i just got rid of my apc 3/4. had it tricked out with arduino temp sensor that mechanically controlled 4 vari fans. also had rgb led strips that changed color based on temp. [0:49] <chainey> damn, NZ. guess i'm not stopping by. [0:55] <chainey> heh.. sounds like my work area. even mix of systems and music stuff. [0:56] <rikkib> I play electric guitar and also have a keyboard (midi) to play stuff. [0:56] <rikkib> Used to have a Bass many years ago before it was stolen. [0:57] <rikkib> If I get a Bass amp the guitar will follow. [1:04] <jvboy> rikkib those urls are real time images? [1:05] <jvboy> how do you do that? [1:05] <jvboy> have some article? [1:06] <jvboy> why the pc? [1:15] <rikkib> The building runs a monitored alarm... Security needs covered. [1:16] <chainey> good practical use for rpi's. better (and cheaper) than a locked down axis net cam. u can shell in, net boot, etc. [2:27] <SpeedEvil> I was just considering using it for an engine controller. [2:38] <Firehopper> http://www.flickr.com/photos/firehopper/sets/72157634187301680/ < this is what I came home from work to see.. dad splurged, and he gives me hell for buying little things. [2:40] <SpeedEvil> well, with those payments. [3:53] <Donta> is there any ZNC 1.0 for rpi? [4:20] <Gallomimia> more io capacity? to what end? [4:21] <Gallomimia> usb and 100baseT ? [4:24] <Gallomimia> compare the video? [4:49] <histo> Gallomimia: what are you going to be using the device you are buying for? [4:51] <histo> Gallomimia: I could even do that with the lower models. [4:52] <Gallomimia> whats your favorite os? [4:54] <histo> Gallomimia: Don't really have a "favorite" I use different os's for different tasks. [5:04] <a5m0> so you can get 2.5A on the USB ports if you bridge the polyfuse on rev2 r-pi, what can you get pre-bridge? [5:05] <jgalt> just downloaded the noobs v1.1 software and unzipped the files to the card as instructed onto the card. all I get is no signal on the hdmi as if the card isn't there. ideas? things to check? [5:06] <shiftplusone> jgalt, did you format the card and copy the files on there? [5:13] <shiftplusone> and just the red LED lights up? [5:15] <shiftplusone> sounds like an incompatable sd card to me. I'd try an img like the raspbian one just to check. [5:15] <shiftplusone> Also, check the power to make sure you're getting 5v, just in case. [5:16] <jgalt> is that not where those files should go? [5:16] <shiftplusone> jgalt, it is, it sounds like you did everything right. [5:19] <rigid> jgalt: the card works when you dd some raspberry OS image to it? [5:19] <jgalt> shiftplusone, how does the RPi go about finding the files it needs to boot? is there not a boos sector on the card that needs to be specially written or some such? [5:20] <shiftplusone> if it doesn't find it, that happens. [5:22] <jgalt> ...then I started over with the noobs download because I liked having the choice of os it aparently has. [5:23] <shiftplusone> jgalt, you can download any of the images NOOBS provides. [5:23] <shiftplusone> You're not limited in any way by not using NOOBS. [5:25] <jgalt> I'm a bit confused... isn't noobs supposed to be one card that allows booting into any of a number of available os? [5:32] <jgalt> thanks for the tip on berryboot, have to look at it further. [5:40] <jgalt> how long shouls it take for noobs to boot the first time? [5:42] <jgalt> ....and how long to see something on the display the first time? [5:42] <jgalt> ....ok, something's wrong then! [5:42] <yggdrasil> is the activity light blinking ? [5:44] <yggdrasil> you cant just copy it over..
[5:44] <shiftplusone> yggdrasil, noobs isn't distributed as an image. [5:51] <jgalt> depends. the img files are structured that way but the noobs installs are aparently one partition. [5:57] <AlkazaR> general question - with Berryboot, you could have a large linux install? i.e. one that uses more disk space than your SD car allows - spreading OS files across the SD card + external USB storage? [5:58] <shiftplusone> I have never used berryboot, but I doubt it. [6:04] <jgalt> writing 2013-02-09 raspbian img to same card. let's see what happens? [6:07] <shiftplusone> jgalt, why such an old image? [6:08] <jgalt> shiftplusone, it's what I had.... the current one no one seems to be seeding at the moment. [6:09] <shiftplusone> there's always the direct download, but nvrm, I guess it doesn't matter too much. [6:13] <shiftplusone> sounds like a power issue then. [6:13] <shiftplusone> have you checked the voltage as I suggested? [6:15] <jgalt> er, well it seems that there are way to many errors of files not found and failed to execute..... actually it's NOT booting just fine! [6:17] <jgalt> seems it's going arounfd in a loop with something about not finding the ethernet interface. 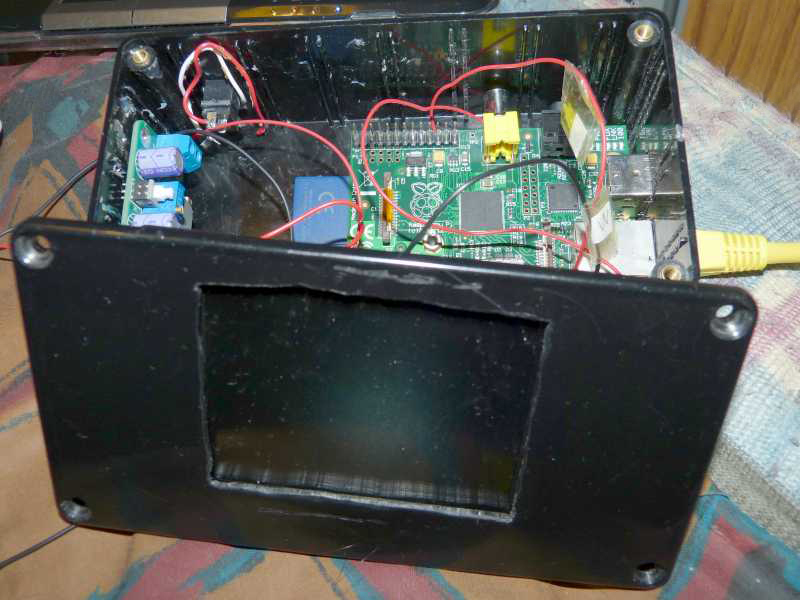 [6:18] <jvboy> a dumb question... if I turn on a service on my rasp-pi over the internet, and someone DDoS attack it, can my rasp-pi be damaged by the attack? [6:18] <jgalt> happen to remember which pins on the header ought have 5v? [6:26] <jgalt> voltage is about 4.8v.... that does seem a bit low. ok seems the adapter is crap! drawing power from the laptop it works fine! [6:27] <shiftplusone> yeah, that would make sense. [6:34] <AlkazaR> jgalt: also important, what mA current was it drawing/was being output by the adapter? specs are between 700 to 1.2 mA, so if that was falling below 700 mA it could also explain instability. [6:38] <Xark> jvboy: Permanent physical damage is highly unlikely unless it overheated or something. [6:39] <Xark> jvboy: Also, your RPi is probably not "directly" on the internet (but typically behind a router/NAT) so that makes it hard to DoS directly (vs your router that would take the brunt). [6:46] <jgalt> looking to add a ds1374c rtc to the RPi. any pointers on setting it up? [8:09] <ItsMeLenny> is it possible to get RGB outputs from the gpio pins? [8:11] <rigid> ItsMeLenny: yes, in theory. but they are too slow afaik. [8:12] <ItsMeLenny> even at low resolutions? [8:44] <ItsMeLenny> can the composite output any resolution? [10:32] <Kaboon> Question for people running Pidora; is it correct that there haven't been any system updates since it has been released? [11:48] <gordonDrogon> so you edit the configs as root. [12:02] <histo> Encrypt: why do you want the drive to idle? [12:03] <LordThumper> Is it possible for a Pi to access the TV's video stream for PVR? [12:04] <LordThumper> The TV is a Samsung running Arch Linux, can the CAM decoded stream be accessed on the TV's /media/vid0 for example? [12:07] <linuxstb> LordThumper: But I guess you would need to run a server application on the TV to stream the channels over the network for the Pi to be able to view them. [12:10] <LordThumper> linuxstb: That was my thought, however I cannot find any instructions online. [12:11] <linuxstb> LordThumper: So /media/vid0 is a device giving you the video data being displayed by the TV? [12:28] <histo> LordThumper: samsung is using arch linux? [12:30] <LordThumper> histo: That should be the decoded stream right? [12:30] <LordThumper> The stream being displayed on the LCD ? [12:32] <histo> LordThumper: One would hope there is a decoded stream somewhere. But I don't even understand how you have access to the software your TV is running in the first place. [12:33] <histo> LordThumper: and you received login how? [12:34] <histo> LordThumper: also why do you think it's running Arch? [12:36] <ShorTie> if you can ssh in does dmesg work ?? [12:38] <LordThumper> I think it's possible to forward the device (if it exists) on telnet too right? [12:38] <LordThumper> histo: Yes I am browsing samygo atm. [12:39] <histo> LordThumper: Why are you trying to decode using the tv? [12:40] <histo> LordThumper: who is the provider? [12:40] <histo> and where does any of this have anything to do with raspberry pi? [12:41] <LordThumper> so, I can (potentially) query the CAM? [12:42] <LordThumper> Ye, well I'll continue browsing samyGO maybe I find what I need. [14:26] <pksato> FR^2: what kind og display? a small one connectecd to GPIO? One big on HDMI out? [14:27] <FR^2> pksato: Well, my dreams want a display with touchscreen and full hdmi resolution, size about 4 inches and of course nearly cost-free. [14:29] <gordonDrogon> think I prefer 4:3 for navigation. [14:29] <pksato> I like to connect RPi on one of these big screen used on stadiuns. [14:29] <gordonDrogon> small display panels are somewhat expensive though. [14:30] <Bushmills> a cheap tablet should do. [14:30] <FR^2> Hmm. Indeed. That's an idea. [14:31] <pksato> small display dont have a hdmi/vga interface. [14:31] <pksato> portable dvd display? [14:32] <pksato> DSI connected display ? [14:35] <pksato> firmware is the big problem. [14:36] <gordonDrogon> much cheaper if you buy direct off ebay too. [14:36] <gordonDrogon> but it's still analog input. [15:52] <donta> what's the easiest way to get an ip off a headless pi? [15:53] <linuxstb> I would try "host raspberrypi"
[15:56] <donta> could I do a 'get' a file from one of my servers and check the ip logs? [15:57] <malcom2073> donta: Then you likely have a router or some other PC running a dhcp server. [15:57] <donta> malcom2073: right, but how would I get that ip if the pi is headless? [15:58] <donta> I'm not sure it keeps logs? [15:58] <malcom2073> Yes, that's a switch. [15:59] <donta> what is then? [15:59] <malcom2073> I don't know how your network is set up, so I couldn't tell you. [15:59] <malcom2073> Ask whoever set up your network? [16:00] <malcom2073> What's on the other side of the wall? [16:00] <malcom2073> Then your fiber modem is likely giving out IP addresses. [16:01] <malcom2073> So it should have DHCP logs somewhere, or at least a list of IP addresses that are assigned. [16:03] <donta> malcom2073: since I have a keyboard, can I make it get a file? [16:04] <malcom2073> Yeah that's fairly useless without a monitor. [16:04] <Bushmills> often, thgere's dhclient on routers which also serves as nameserver, and associates the assigned ip address with the name the device passes to it. [16:05] <malcom2073> Bushmills: hmm, ping pi maybe work? [16:05] <Bushmills> the name depends on OS or distribution. [16:08] <malcom2073> donta: you running windows? [16:11] <malcom2073> Very unlikely. Different internal IP's I'm sure. [16:18] <arcanescu> does wheezy have a snapshot of libsoup? [16:19] <malcom2073> donta: Doesn't matter, any of my solutions will still work for you. [16:23] <niddam99> donta: best idea! [16:24] <HonkeyGenius> i was going to suggest a monitor about 20 minutes ago but i thought you guys were having a nice chat. [16:24] <malcom2073> We already suggested it. [16:24] <malcom2073> tbh I don't blame him, checkinglogs, or pinging a range, or anything else is easier. [17:09] <IT_Sean> Are they shiny? [17:09] <IT_Sean> Do they light up? [17:13] <IT_Sean> Err outing video without a switch designed to do so has a strong possibility of causing timing issues w/ the video signal. [17:13] <IT_Sean> But... Good luck. [17:13] <steve_rox> but any risk of damage? [17:14] <IT_Sean> You are talking about composite video, right? [17:15] <IT_Sean> Snaffing about with HDMI would cause it to very much not work at all. [17:16] <IT_Sean> Do you have a switch that turns the big red LED on the front of the case on/off? [17:17] <IT_Sean> ..... And why not?! [17:17] <IT_Sean> But.... But... BLINKY! [17:19] <IT_Sean> No case is complete without a flarpswitch. [17:19] <IT_Sean> You NEED a flarpswitch. [17:20] <IT_Sean> YOU. NEED. A. FLARPSWITCH. [17:20] <IT_Sean> That's rule #1 of case building. [17:21] <steve_rox> perhaps i should put them on for you ? [17:21] <IT_Sean> Those don't count. [17:21] <IT_Sean> No one can see ir. [17:38] <Davespice> which dongle is it zproc? [17:40] <Davespice> do you plan to try and use hostapd? [18:12] <FR^2> What's that "visual" programming language called again? [18:15] <FR^2> zproc: Ah, indeed, thanks! [18:30] <jbaanus> I just followed this guide http://lifehacker.com/5978594/turn-a-raspberry-pi-into-an-airplay-receiver-for-streaming-music-in-your-living-room and it is just awesome! [18:34] <Davespice> a modified bigtrak maybe? [18:39] <ripplebit> guys i followed the quickstart guide at raspberrypi.org, but when i plug in my pi to a monitor and plug in the power supply, nothing happens. [18:40] <Eduard_Munteanu> Hi. It seems like http://www.raspberrypi.org/downloads fails to load... *https*, mind. [18:40] <Eduard_Munteanu> Any chance there's a quick fix for that? [18:40] <steve_rox> no led light up? [18:41] <Eduard_Munteanu> As to why, it's pretty obvious those checksums should be authentic. [18:42] <ripplebit> can i still do it? [18:42] <Eduard_Munteanu> Or perhaps there's a mirror which provides https access or some other way to confirm those checksums? [18:42] <mgottschlag> huh, how did you get the operating system onto the sd card in the first place then? [18:43] <ripplebit> brilliant, how can i do that? [18:44] <mgottschlag> 1. find out the IP of the pi, 2. start an SSH program, 3. use it to login into the address using the user "pi"
[18:46] <donta> malcom2073: I got it!!! [18:46] <ripplebit> do i need to connect to my laptop or router through lan? [18:47] <TheDracle> Has anyone here successfully recorded audio using pulseaudio? [18:47] <TheDracle> I am able to record via ALSA, but when I install pulse, it detects my USB microphone, and lists the devices, but they don't record anything. [18:50] <Eduard_Munteanu> Who's maintaining raspbian.org? I think http://www.raspbian.org/RaspbianRepository should be fixed to use https. [18:50] <Eduard_Munteanu> That seems rather unsafe. [18:51] <ripplebit> mgottschlag: by the way, what i did was unzip the NOOB_v1 onto the SD card. Was that correct? [18:51] <donta> does fail2ban work well if I have no firewall? [18:53] <Bushmills> depends what you call "firewall" resp "no firewall"
[18:54] <donta> so fail2ban works best if I only have port 22 open? [18:55] <Bushmills> no, not really "best only in that specific condition"
[18:56] <donta> interesting or better? [18:58] <Bushmills> an fail2ban had some security issue just recently. can't give detail, as i only glimpsed at the email, because it didn't concern me. [18:59] <donta> Looks like there's new OS updates today? [19:00] <Squarepy> first plug in then boot up, ripplebit ? [19:02] <Bushmills> i'd conclude "something doesn't work right"
[19:08] <mgottschlag> ripplebit: how far did you get with ssh? [19:08] <mgottschlag> doesn't your router tell you somewhere in the DHCP settings? [19:12] <derjanni> Hello everybody! I installed a -dev package, but dont have a /src directory - where are the sources? [19:13] <derjanni> but where are the header files then? [19:14] <derjanni> I have an application that I want to compile that uses libpopt, but I complains "undefined reference to `poptGetContext"
[19:16] <ripplebit> Bushmills: i get "1 IP address"
[19:16] <derjanni> hm, still wondering why I get "undefined reference"
[19:18] <jgalt> how do I rerun the raspbian setup program.... the one that runs on 1st boot? [19:27] <Bushmills> your router bridges wlan and ethernet, so they are in the same subnet? [19:27] <mgottschlag> are the network LEDs lit? [19:28] <mgottschlag> but the pi has one, right? [19:28] <mgottschlag> to what is that connected? [19:28] <Bushmills> so where does raspberry ethernet cable go to? [19:29] <ripplebit> haha was that wrong? [19:29] <mgottschlag> (like, "shared internet connection" or "network bridge"
[19:31] <ripplebit> so when i ping -b, do i used 192.168.0.255 , the laptop address of the router ip? [19:34] <ripplebit> how can i search the router for the pi ip then? [19:37] <ripplebit> Bushmills: how do i log in using ssh? [19:39] <ripplebit> is it meant to ? [19:40] <mgottschlag> "<mgottschlag> maybe try rebooting the pi with the network cable attached" - already tried? [19:44] <Bushmills> what do the LEDs on raspberry do when booting? [19:45] <pksato> question. NOOBs have a networking ? [19:46] <Bushmills> depends what you call "network"
[19:46] <Bushmills> a laptop connected to a router, is that a network? [19:47] <_21h_> anybody know how to make internet radio by ripping anything from sound card mic and output? [19:49] <pksato> if I not missed any lines, ripplebit upload NOOBs to SD card at work. I suspect that noobs dont have way to setup via network. [20:07] <Bushmills> how did you write your sd card? [20:14] <jgalt> having trouble with eth0 looseing it's address. any ideas? [20:18] <ripplebit> people will a pi work with a 800mA powersupply? [20:25] <Squarepy> ripplebit, what format is the sd card in? [20:33] <ripplebit> no,what is it? [20:34] <ripplebit> oh right. although im not sure it's the boot loader that's the issue. [20:35] <ripplebit> does the SD need an image to be recognized by my network? [20:41] <Squarepy> is something unclear ripplebit ? [20:41] <ripplebit> Squarepy: but i think there might be another issue with my pi. How could i test whether or not it's working? [20:42] <ripplebit> Bushmills: If the image wasn't flashed correctly, will my monitor pick anything up? [20:44] <Bushmills> get image. sector-write to device. boot from it. [20:46] <ozzzy> http://www.togastro.com/ozzzy/images/pi_setup.jpg <-- IT'S ALIVE!!! [20:47] <Bushmills> grep the insecticide. the fungizide, the weapons of mass destruction. [20:53] <yggdrasil> anyone here used pibang ? [20:53] <yggdrasil> crunchbang for pi ? [20:54] <yggdrasil> cant seem to get it to boot. [20:55] <yggdrasil> i guesse not. [20:56] <yggdrasil> has anyone here used crunchbang linux for the raspberry pi ...? [20:56] <Squarepy> yggdrasil, what is your problem, etc. [20:58] <ozzzy> it wants you to enter which runlevel you want? [20:59] <Bushmills> but that wasn't your question. your question was "anyonew here uses it"
[21:00] <yggdrasil> yea so the n i do 2 and it just returns no processes vailible. [21:01] <yggdrasil> hold on guys. [21:14] <yggdrasil> see if that works. [21:15] <yggdrasil> if not , forget it. [21:15] <yggdrasil> the raspian is just fine. [21:16] <yggdrasil> downloading it again..
[21:16] <yggdrasil> hmm u know maybe i didnt unmount the card prior to writing. [21:16] <yggdrasil> let me try that. [21:16] <Bushmills> that sounds more like it. [21:17] <yggdrasil> yea wierd it didnt ask. [21:17] <yggdrasil> it was definelty mounted though. [21:18] <yggdrasil> ill keep you posted. [21:19] <yggdrasil> just overwrote my good image ! [21:19] <yggdrasil> oh well there goes afew hours. [21:20] <Bushmills> have you ever wondered whether fiddling with computers, an occupation which requires a considerable amount of accurate working, is the right thing for you? [21:25] <yggdrasil> and yep its the right place for me. [21:26] <yggdrasil> its a huge workload and a desire to play wit hthe pi at the same time. [21:29] <yggdrasil> ahh awesome, i didnt overwrite it. [21:36] <yggdrasil> oh yea , that worked better. [21:36] <yggdrasil> lets see what crunchbang has to offer. [21:40] <donta> how long does it normally take on an RPi? [21:43] <yggdrasil> what is znc? [21:44] * SpeedEvil is using quassel on his Pi. [21:45] <yggdrasil> donta: looks coool. [21:47] <yggdrasil> hmm ijust leave irssi logged in on my vm / shell. [21:57] <Otaku_> can i get support for omxplayer on raspbian here? [21:58] <SpeedEvil> Well, you can ask questions. [21:58] <Otaku_> I have a .mkv file with .h264 video codec and a seperate sub stream. [21:58] <Otaku_> but even with --align left the subs start nearly in the middle of the screen. [22:05] <SpeedEvil> I've never used my pi to playback media. [22:06] <SpeedEvil> However, perhaps one of the fine lurkers can answer your question when they return from climbing Everest. [22:06] <Davespice> I presume omxplayer? [22:07] <pksato> sub whit long lines? [22:08] <pksato> oh... sub is not centered. [22:09] <Otaku_> i said omxplayer! [22:09] <Otaku_> so should i try --align center? [22:09] <pksato> center is not default? [22:10] <pksato> or, not all video is on screen, only partial. [22:10] <pksato> main omxplayer now support external sub? [22:13] <Otaku_> there's a huge difference between german and english web culture. [22:14] <HonkeyGenius> Otaku_, curious. what do you mean? [22:14] <SpeedEvil> Who said Pi wasn't educational. [22:15] <Otaku_> In german, you find animes on the sub groups personal sites, as DDL or one click hoster. [22:15] <Otaku_> In english, the sub groups rerely offer them directly. there are onl�y huge portals, and only torrent. [22:27] <jgalt> what is the most current the raspberry pi should draw with usb kb, usb mouse, hdmi tv, & ethernet attached while using 100% cpu? [22:44] <LordDoskias> or the pthread ones? [22:45] <pksato> Ely_arp: all day, some ask about it. [22:46] <BillyBag2> Hi, can I mount a secong SD card connected on the SPI? [22:47] <BillyBag2> I saw an artical on it but I can not search for SD card as this is too common. [22:51] <BurtyB> BillyBag2, I don't see why not but don't expect it to be anywhere near as fast as the primary one. [23:55] <SgrA> Just like arm_freq_min in /boot/config.txt, can I also specify core_freq_min, sdram_freq_min too?